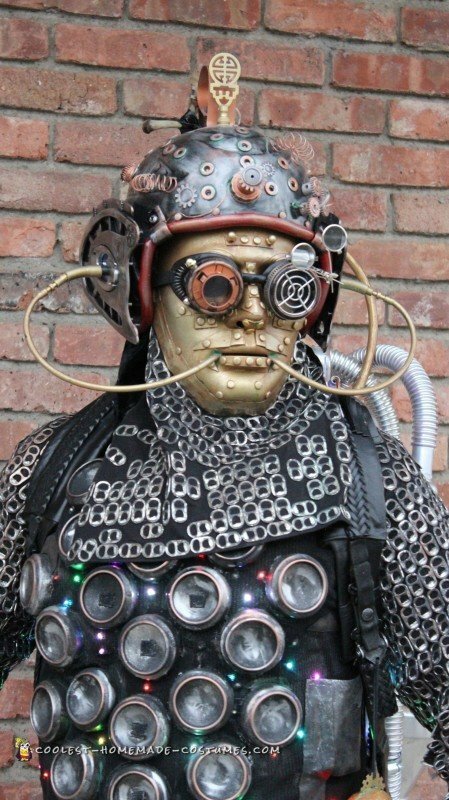 The Extraterrestrial Steampunk Cyborg costume came about after my mother told me a story about an uncle of mine. 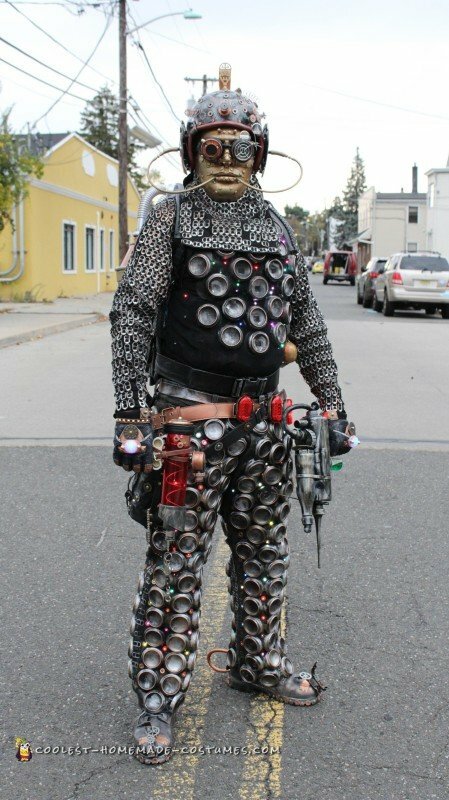 He once dressed draped in cans at a Carnival many years ago. Well, I had the desire to try and recreate the exact costume but that did not go well. 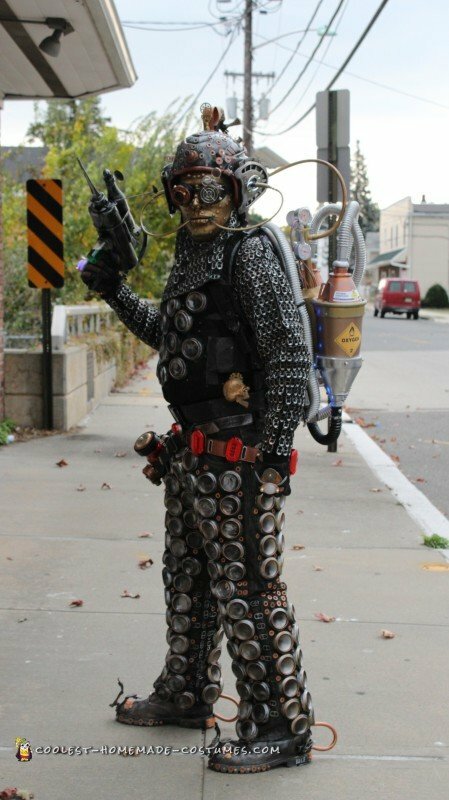 In my sleep I dreamed of being a Cyborg dressed in armor made of cans and the rest is history, the challenge was on! So, take a look at my DIY costume in action below. 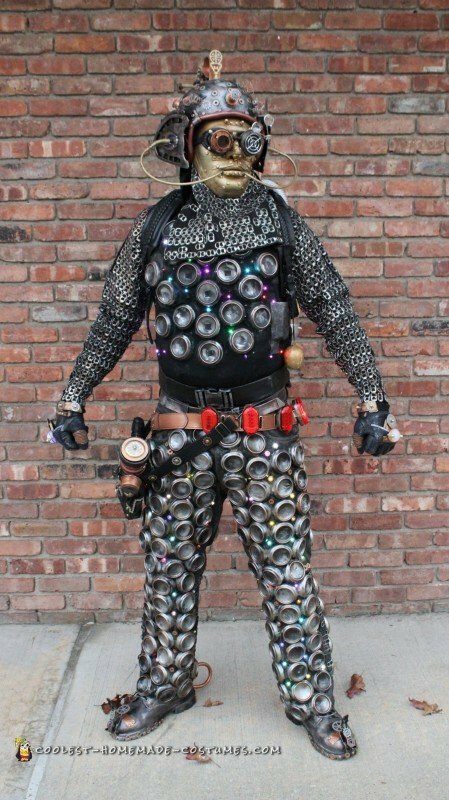 The Cyborg costume was created using recyclable materials such as: old jeans, 200 + free beer cans from the local recycle company, beer can tabs, old pullover shirt, old boots, old faux leather curtains, rubber hose, old computer case, water pitchers, plant feeders, children’s plastic whistle blower hose toy, old belt, vacuum hose, metal washers and screws, radiator valve, brass paper fasteners, backpack belt, lawn hose Y connector, printer ink casing, old plastic gears, metal springs, old baseball helmet, old raincoat, shampoo bottle, soda bottle, Led bicycle lights, and motorcycle gloves. Metallic spray paint, metallic acrylic paint, Gem-Tac adhesive, Fabri-Tac adhesive, Multi- Grip adhesive. Over 360 rainbow flashing Led lights. Gorilla glue, Gorilla tape, Masking tape, and duck tape. Tools: Dremel, Drill, and screwdrivers. My over all experience was fantastic as I marched in The Village Halloween Parade in New York City followed by a night out at the famous club Webster Hall on the lower east side of Manhattan. I had questions and compliments about my costume all day and night long – they all loved it. The easiest part was the thought of the costume in my mind, the hardest was creating it, it was all trial and error with great results.